On the path to solving the world’s greatest problems, there are challenges that are too big for any one organization to tackle. Only together can a community advance. One such complex concern is the transformation of education. In 2014, ORION came together with the community to address the issue in a new way at #EdAppHack. A two-day hackathon connected high school students, teachers and community mentors to test drive the classroom of the future. In the MaRS auditorium in downtown Toronto, more than 200 high school students, teachers and volunteers are working feverishly at tables laden with laptops. They have just two days to create an app, and the deadline for the pitch competition is getting closer by the minute. They’re at #EdAppHack—the first event of its kind in Canada to be driven by high school student–led solutions—organized by Toronto District School Board (TDSB) teachers Joseph Romano and Brandon Zoras. They’re supported by a unique community of partners, each contributing according to their expertise: MaRS Discovery District’s space and startup roots, Humber College’s computer science mentors, and ORION connecting them to the cloud resources and content they need. The goal: to promote a new paradigm of self-directed, engaged learning and foster technological skills in students. Romano and Zoras created #EdAppHack as a way of giving students both a chance to identify problems in the education system and the skills they need to solve them. “We want the students to develop a technical skill set and explore a new way of thinking about learning,” says Romano. Providing the students an opportunity to practise inquiry-based learning in a non-classroom setting was key. “We’ve learned a lot about computer science and programming in school, but coming to an event like this actually allows us to put those skills to work,” says Kirill Kozlov, one of a group of Grade 12 students from William Lyon Mackenzie Collegiate Institute in Toronto. He and his group developed an app to foster communication between teachers and students. Kozlov says the event was about more than just having a successful pitch and a working prototype at the end of the weekend. 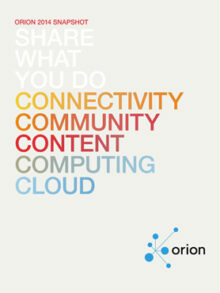 ORION connects our communities both through a physical network and by working with them on important issues. Sponsoring events like #EdAppHack helps foster the collaboration that is crucial to advancing new ideas and ensuring Ontario stays at the forefront of innovation. Find out about others on the ORION network who are doing amazing things to further research, education and innovation in Ontario in our Annual Snapshot.